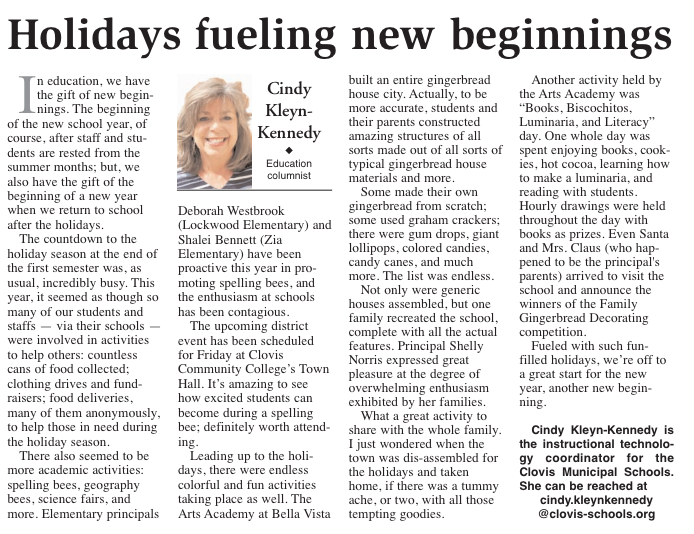 Coordinator of Instructional Technology for Clovis Municipal Schools, Cindy Kleyn-Kennedy writes an education column, published weekly by the Eastern New Mexico News and featured on www.clovis-schools.org. Dropping by Cameo Elementary recently near the end of a school day, I came upon Cameo teachers organizing furniture and technology devices in the school’s multi-purpose room. There was lots of activity and energy in the air; the event was “Bingo For Books” that would be held that evening. 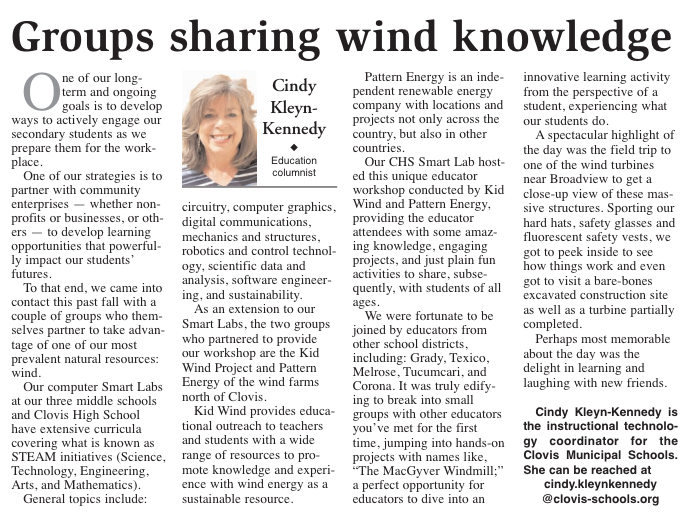 Talking to veteran teachers, Keith and Kathryn Sacane, who were connecting a digital tablet to the projector for a giant image on the wall, they filled in the blanks. Keith Sacane, who served as a band director for a number of years in our district, has been the music teacher at Cameo in recent years. 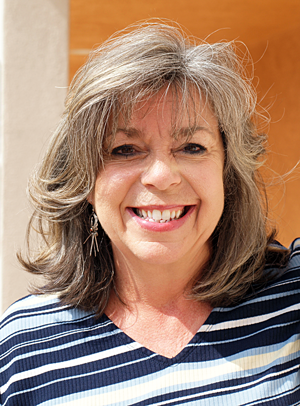 His wife, Kathryn, is not far off twenty years of teaching, the last thirteen, or so, at Cameo. 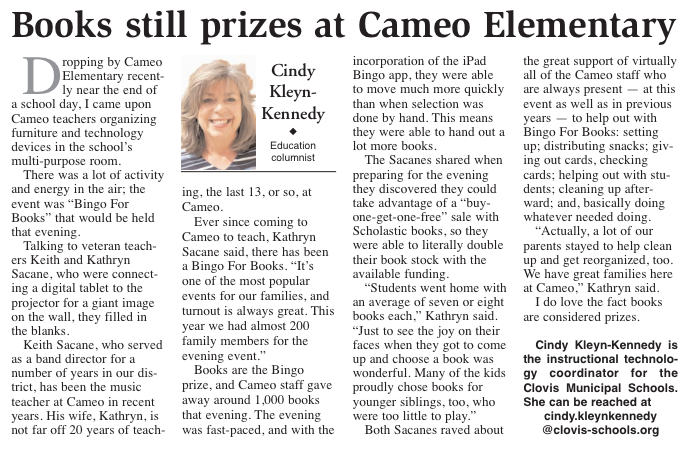 Ever since coming to Cameo to teach, Mrs. Sacane said, there has been a Bingo For Books; “It’s one of the most popular events for our families, and turnout is always great. This year we had almost 200 family members for the evening event.” Books are the Bingo prize, and Cameo staff gave away around a thousand books that evening. The evening was fast-paced, and with the incorporation of the iPad Bingo app, they were able to move much more quickly than when selection was done by hand. This means they were able to hand out a lot more books. I do love the fact books are considered prizes. IT'S A ZOO AT THE ARTS ACADEMY!